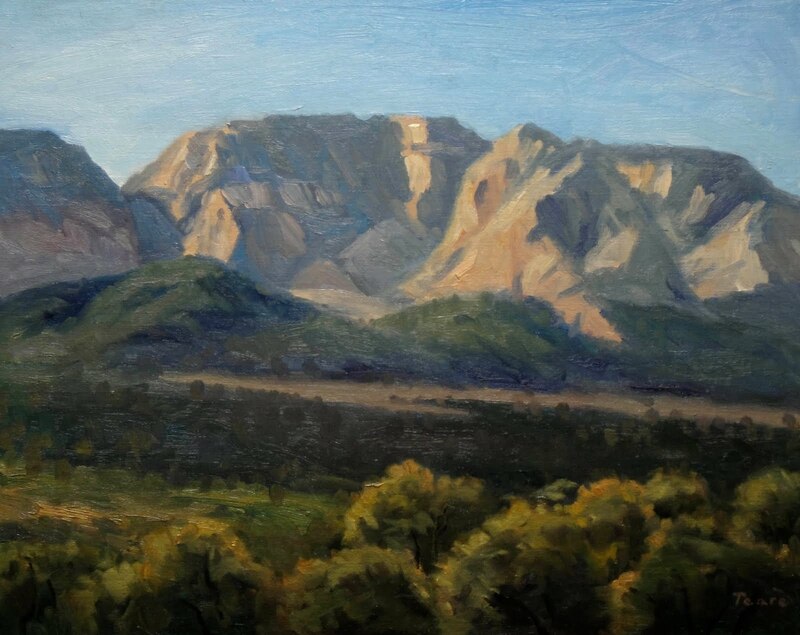 ALTHOUGH I am primarily self-taught I have been privileged to take workshops from several excellent painters. But it has always mystified me how assimilating information, even from a gifted artist, never leads to painting at the level of the teacher. After some reflection I decided that the reason it is difficult to assimilate artistic lessons from artistic mentors, no matter how gifted or well-intentioned, is because everyone has a different combination of strengths and weaknesses. These specific strengths and weaknesses need to be addressed specifically. Additionally the neophytes' challenge is to learn a specific set of skills unique to his or her ultimate way of painting. This challenge is made more difficult because neither teacher nor student know the ultimate parameters of the artist's ultimate unique style. For years I painted in the field using a wood palette. This wood palette has been stained by repeated applications of paint. I felt this dark palette was not only adequate but desirable because a famous artist I read about used a similar palette. I also used canvasses tinted with red iron oxide because it is a successful method I use in the studio. It took me a long time to consider that this might not be the optimal method for me to use in the field. I observed that when I painted en plein air my paintings were often plagued with weak color, especially in the darks. Gradually it dawned on me that using a dark palette caused me to pitch my colors to the dark side because darks on a dark palette looked lighter. To remedy the situation I decided I need to paint on a white palette. Darks on a white palette look very dark and so the white palette should help me keep dark and middle value colors fully saturated. Of course this remedy may cause me to mix my lights too light. To remedy that negative possibility I will paint on a blank white canvas. By painting on a white canvas my darks will look very dark and will remedy my tendency to desaturate color by painting darks too dark and my lights too light. It will also be advisable to paint the sky last, placing my darkest colors first and gradually lightening as I go. This is somewhat counterintuitive because in the studio I paint distant things first and work my way toward the foreground (this helps me with edges and overlapping shapes). I believe this new method will help me with the more basic problem of getting correct relationships between darks and lights which, at the moment, seems to be my problem in the field. If we could find teachers with the exact strengths and weaknesses we have, or teachers who can imagine such weaknesses and know how to remedy them, we could find the perfect teachers. Until then we have to tally up our strengths and weaknesses and devise ways to cancel or offset those weaknesses. We also might change our methods to remedy specific problems at specific times. In other words we have to be as creative in overcoming our personal obstacles, in teaching ourselves, as we are in the creative act itself. then experiment as you did and never stop to question: Is there other ways? When I was at art school a professor asked me why I was painting landscape like the impressionists. He told me they had already said everything there was to say about landscape so further exploration of landscape was redundant. He encouraged me to explore abstract expressionism instead. My reaction was that the impressionists hadn't said it all and that there was still much to be revealed in the art of the landscape. We would see this new way of portraying the landscape when its practitioners revealed it in paint. But the idea that the impressionist said the final word on landscape painting seemed ludicrous to me. The fact that change and progress regarding landscape painting is progressing slowly is not evidence of no progress. Today's leading landscape painters paint very differently than the impressionists did. As you suggest we must always question our methods and explore new ways of expressing ourselves in paint.